The Red River Gorge is a world class sport climbing destination. Development has been occurring at an exponential pace over the past two decades with well over 2000 routes now. However, the majority of routes have been developed using zinc plated hardware. Unfortunately, due to the humid conditions and soft, mineral rich corbin sandstone many of these bolts are corroding and are in need of replacement. Due to the large volume of aging sport climbs and the very few that choose to help, it is an ever growing struggle to keep pace with the needs for re-bolting. With vast potential for even more development, it is critical that the cycle of new development with sub optimal materials followed by frequent re-bolting be immediately stopped. The Red River Gorge Fixed Gear Initiative (RRG FGI) was created to facilitate a partnership between developers, climbers, industry, and non-profits to promote sustainable fixed gear solutions for rock climbing in the Red River Gorge for the preservation of the rock and the long term benefit of the community. 100% of your donation is used for improvement and maintenance of fixed gear in the Red. The fundraising efforts of the RRG FGI can be broken down into 3 separate categories. Community donations are pooled with developer's contribution to purchase stainless steel bolts. We offer both stainless steel expansion bolts and glue ins to developers at a reduced price that allows continued development with more sustainable materials. The RRG Fixed Gear is proud to have partnered with ClimbTech to provide us with the hardware required for new development. From November, 2013 to current over 7000 stainless steel subsidized bolts have been purchased and distributed to developers. All bolts are placed at crags that have, or are expected to have public access and routes will follow a normal grade distribution that is common of the Red. Much of the zinc-plated fixed gear in the Red River Gorge is well past it's first decade of use and is showing it's age. A group of a few dedicated developers have been willing to donate their time and effort to the critical enterprise of re-bolting routes. Until this year, the majority of the costs were the burden of those who chose to help out. Recently, we have been extremely fortunate to benefit from a partnership with the American Safe Climbing Association. They have been instrumental in providing some of the materials for re-bolting including stainless steel bolts (ClimbTech Wave Glue-ins), epoxy, brushes, bits, and patching glue. However, RRG FGI is also proud to fund-raise directly for bad bolt replacement and has supported Re-bolt the Red Event since 2015. 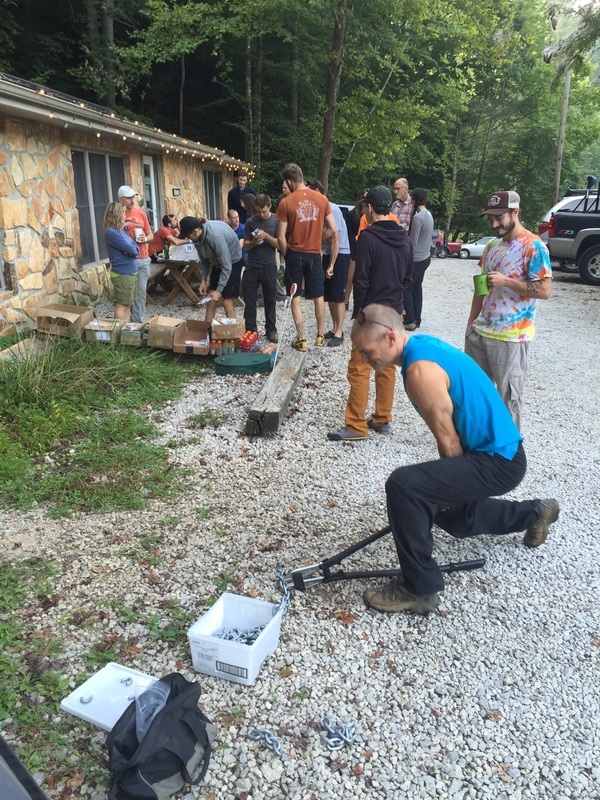 Each year developers partner with community volunteers to form teams allowing hundreds of bolts to be replaced at different crags in one day. Our re-bolting efforts are ongoing through the year. You can stay up-to-date of events and re-bolting days by joining the Facebook group RRG Rebolting. Permadraws are also considered to be fixed gear in the Red. It is understandable that people have differing opinions as to how and if these should be used in the Red River Gorge. 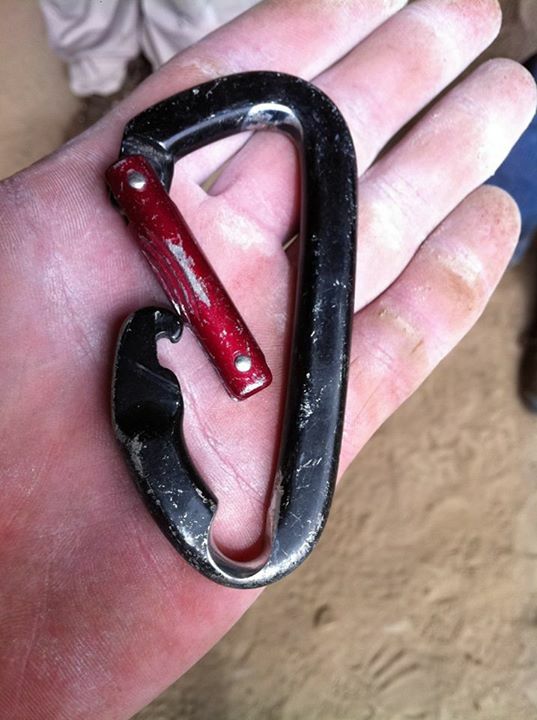 However, history has shown that dangerously sharp aluminum carabiners will pop up in the absence of permadraws. It is also important to recognize that permadraws are also anything but and they too will wear, albeit about ten times slower than their aluminum counterpart. It is also understood that not every climber benefits from the existence of permadraws. Due to this, we will keep funding for permadraws completely separate from the general Fixed Gear Fund. Specific campaigns will solicit for permadraw funding and will be supported to the extent that the community chooses. This gear will be placed as sparingly as possible, on a case by case basis.